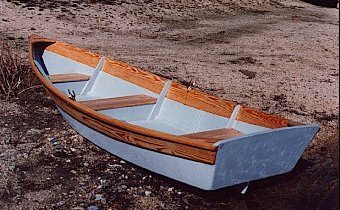 Bay Skiff 12 was designed for a hardware store owner in St. Michaels, MD. He wanted a handy-sized skiff for rowing and sailing. The Bay Skiff 12 is stable and will carry an adult and two children or two adults and a picnic lunch for an afternoon or evening on the water. Construction is rugged 3/8" plywood with an optional 3/4" sheerstrake. Plans include a materials list, panel dimensions, construction drawings, and a new sail plan. No lofting is required. Estimated cost for quality construction materials (not including sails) is $1200. This cost includes a high level of outfit and finish you can be proud of after putting the effort into building this fine boat. Purchase and Download Study Plans for the BAY SKIFF 12 for $5.00 in PDF format (zipped file). 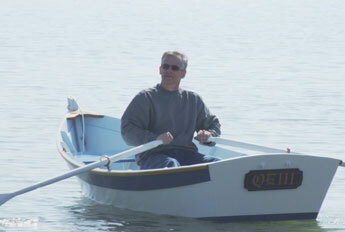 Purchase Construction Plans for the BAY SKIFF 12 for $55.00 for delivery by US Postal Service. Send an e-mail to karl@cmdboats.com with your order to receive an electronic set of construction plans to read on your computer or have printed locally (i.e. at a UPS Store, Office Depot, Staples, etc, that has a wide format printer) instead of USPS mailed hard copy. We are interested to know how we can to help you get underway!